Fake receipt: The company itself may be fake, or the person making the purchase may have created a fake receipt in order to keep the money. Altered receipt: It is possible that someone may have altered the receipt after receiving it from the supplier. For example, adding 0′s to the end. Kickbacks: The employee purchasing the item and the supplier could have colluded to inflate the price, splitting the extra profits between them. Receipt auditing is essential to prevent this type of fraud. It involves randomly selecting receipts and going to the original supplier to check if the receipt is real, and the price is correct. 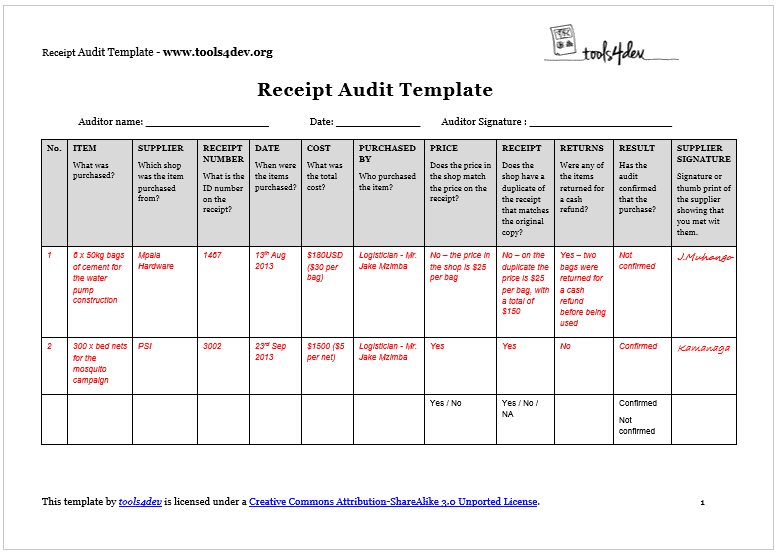 This template is a simple form that can be used to record audit results for receipts. For more tips see our article How to (try to) stop fraud on your project. You want to prevent or detect fraud on your program. You want to check that purchases made are real. You are auditing a small to medium size program. You are auditing a large or complex program. The donor has asked you to hire an independent firm to do the audit. 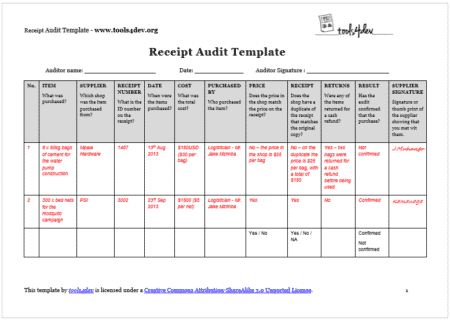 The Receipt Audit Template by tools4dev is licensed under a Creative Commons Attribution-ShareAlike 3.0 Unported License. All other content is © tools4dev.